Chateau Herálec Boutique Hotel & Spa by L’Occitane, presents its clients with a unique place for perfect relaxation. 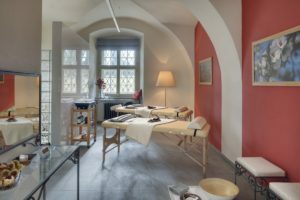 As the first hotel in the Czech Republic, we obtained a license to operate a Spa by L’OCCITANE. All this was possible thanks to the high standard of our hotel services, the extraordinary atmosphere of the castle, our philosophy of relaxation combined with the magical nature of Vysočina. Our L’OCCITANE Spa is a guarantee of an unforgettable experience that you would also experience in the original L’Occitane Spa at the 5-star Couvent des Minimes in Provence. 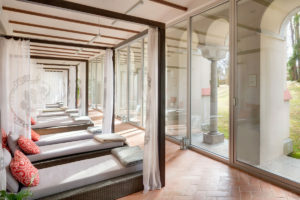 Let your body and soul be pampered in the luxurious environment of our chateau with the unique natural cosmetics of L’OCCITANE in the highest quality. In the intimate atmosphere of the massage area, our trained physiotherapists and masseurs will be dedicated to you with the utmost care and attention. From the inspiring selection of L’OCCITANE procedures, you will definitely choose the right one. The authentic ingredients of this exceptional natural cosmetics, combined with traditional massage techniques, bring deep relaxation. 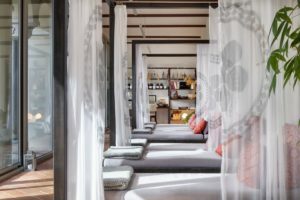 A haven for your soul and senses will be the interiors of our massage rooms inspired by the unique environment of the Camarque of Provence. Spa treatments by L’OCCITANE are not just a woman’s way of thinking. The L’OCCITANE brand also offers comprehensive product lines and spa procedures designed specifically for men. 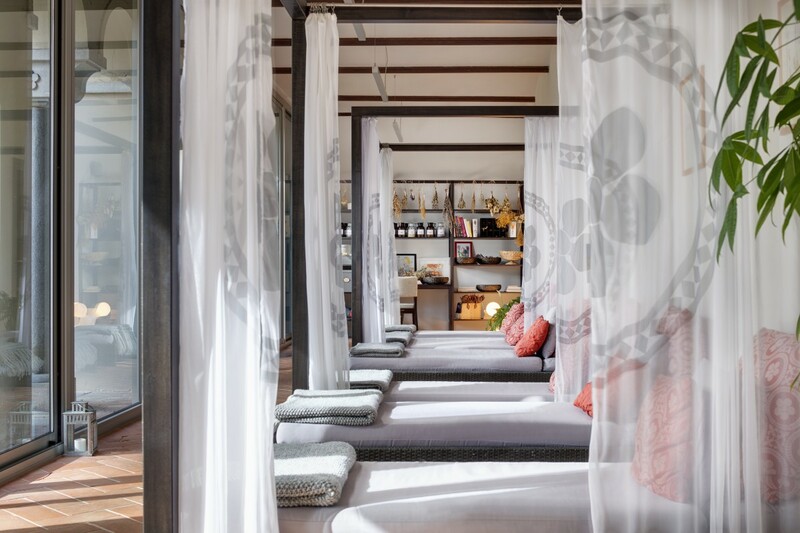 The unusual experience of Spa by L’OCCITANE procedures can also be experienced by non-residents. If you are interested, feel free to contact our reception. We will make a reservation and provide more detailed information. Rest and healthcare are dedicated to the entire southern wing of the castle. 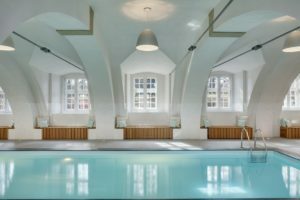 Under the original medieval vaults, there is a private swimming pool with a relaxed chamber space. The benches with comfortable cushions in the window niches invite the rest. You will also find a spacious traditional Finnish sauna, a smaller herbal sauna, an infra sauna or a steam sauna. Absolute relaxation can be enjoyed in the silencarium – a long arcade under the castle orangery, where the interior with the park connects in an original way. Whirlpool in the privacy of the castle tower will provide you with discreet rest. Those who prefer to relax actively, the chateau includes a fitness with state-of-the-art equipment. For the even better regeneration of your body and spirit, we are equipped with the Biosynchron technology. In our castle spa, at the end of the southern wing in the extension build in the 19th century, we have created an intimate sauna world for you. One spacious Finnish sauna, a smaller Finnish sauna with the possibility of using natural herbal extracts and the popular steam sauna lay perfect grounds for you to leave our resort truly rested. After choosing the sauna of your liking, a cold water shower will no doubt cool you down. You can then relax your body and mind on our chaise lounges by the pool, in the resting area or in our English park, a true oasis of peace. 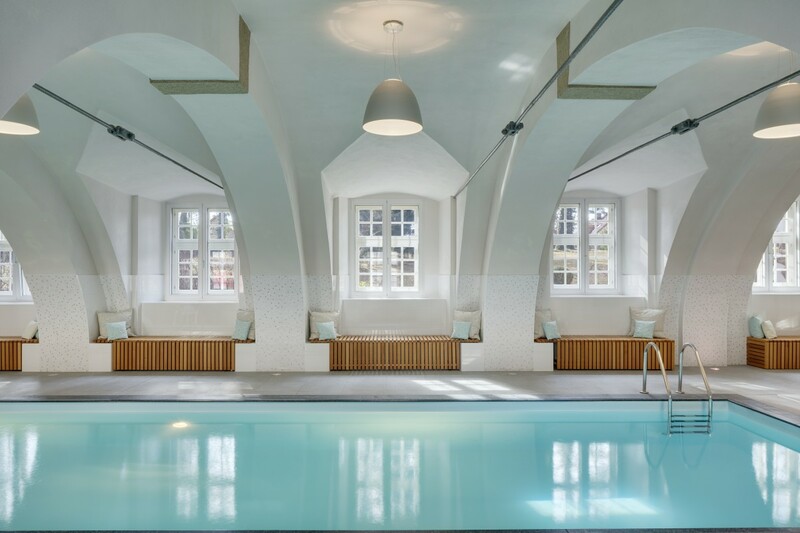 Chateau Heralec is proud of its beautiful swimming pool built under historical arches. The stylish area of the castle spa, where horse stables were once located, is now dominated by a glistening water surface. When we dug out the pool under the watchful eye of conservationists, we very quickly stumbled upon the founding rock of the castle. This discovery confirmed the fact that the original Heralec stronghold from the 12th century was built upon a rock foundation. Today, ‘silver’ control rods that once ensured that the building’s statics remain intact ‘decorate’ the interior of the pool area and still dutifully serve their purpose. The turret has proven to be the perfect location for the whirlpool, a very popular spa activity. 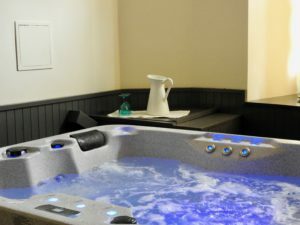 The whirlpool is located in the castle spa behind the resting room in the Southern wing, where guests like to rest after a nice massage or time spent in the sauna. The black pearl surface blends beautifully with the black-sand tile work that we discovered on the 2nd floor of the Southern wing. We managed to preserve the tile work only in this very location. For absolute privacy and comfort, you can reserve the whirlpool just your you and your partner, perhaps ordering a bottle of sparkling champagne along with it. When entering SILENCARIUM resting room in our castle spa, most guests stop breathing at the concentration of beauty and peace in the room. It is an area of absolute quietness, disturbed perhaps only by the birds in the English park. You can rest here after time spent in the sauna, read a book or just marvel at the sight of the beautiful magnificent trees in front of you. Lying on the simple yet comfortable beds, wrapped in one of our castle blankets, not dozing off becomes extremely difficult. It was in the spirit of simplicity and purity that we approached this area with great respect. The castle arcade was formed in the first half of the 19th century during a process that returned gothic era elements to the Southern wing. The arcade is decorated by simple pillars, upon which a no doubt enlightened stonemason carved out a very simple symbol – a five petal rose. Thanks to its clean lines and graphic purity, we fell in love with the symbol and chose it as the Chateau Heralec logo. Today, you can find the logo everywhere. It decorates specially woven fabric, original lamp shades, furniture… truly bringing the interior decor together. Do you know that a herbarium is? Historically, it was always a place used for storage of herbs that the apothecaries dried in garrets or attics of their pharmacies. 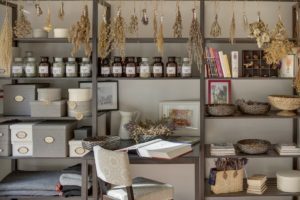 As we feel respect and admiration for traditions of our ancestors, you can find a herbarium also in our castle. We store fragrant herbs grown in the castle park in lovely boxes on wooden shelves, supplying our kitchen and bar with them. 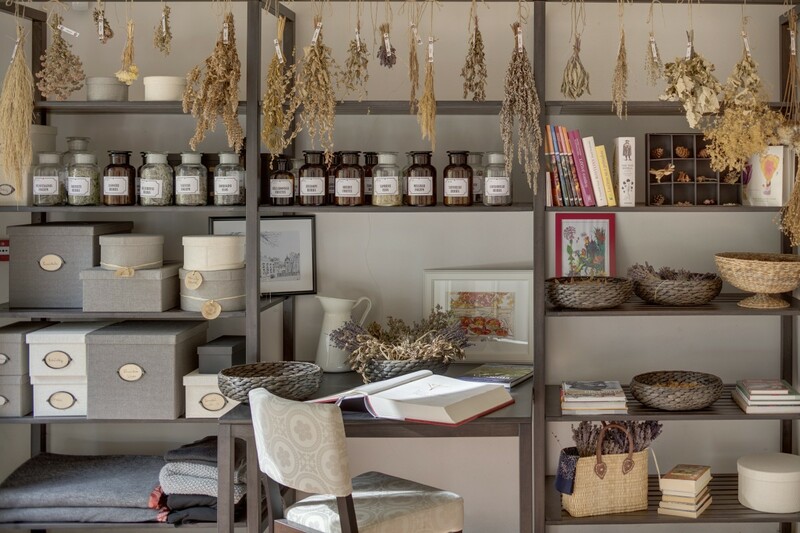 Maybe you remember from your school years the act of collecting, drying and pressing of herbs in newspapers sheets under piles of books, sticking them on clean pages of beautiful notebooks later. Go ahead and leaf through our castle version! The large book with flowers and herbs, grown in the castle park, has now its dignified place in the herbarium. For those who want to experience absolute relaxation and tension release, a massage in our castle spa is a MUST! We have a wide range of massages for you to choose from with everything from classical massages, to lymphatic drainage or lava stone massages. We are also one of the few hotels that offer the very interesting Hawaiian massage Lomi Lomi. The exquisite Peter Beran, who is in charge of our team of professional masseuses traveled to Hawaii himself to perfect his and his team’s technique in this massage. Couple massages directly in your room are also very popular and are a wonderful experience for both you and your partner. We advise all our guests to visit our sauna world before getting a massage done, as it is the perfect preparation for the body before getting a massage and will only enhance your experience. At Chateau Heralec, we all love sports and believe that working out has a very positive influence on both the body and mind. A fitness center in our castle spa, equipped with the most modern equipment, can be found in the Southern wing. We did not compromise with the equipment allowing even the most demanding of our clients to enjoy their time spent in the gym. An interesting fact to note – during the reconstruction, we discovered a ‘black kitchen’ in the area where the gym stands today, leading us to conclude that it was once the location of the castle kitchen. We bet you’ve never run on the treadmill in a kitchen before! If you prefer to run outdoors, our English park and the surrounding forests are also great. For even better regeneration of your body and mind, we have equipped the chateau Wellness & Spa with Biosynchron technology. This is a totally unique form of passive therapy, based on the principles of dry thermo-therapy and pulsating magnetic therapy. It is used by both professional and recreational athletes, also being suitable for physiotherapy and rehabilitation purposes with anti-stress effects. BIOSYNCHRON facilitates the flow of blood in the peripheral circulatory system (capillaries), which promotes blood circulation and detoxify the body. This relaxes the muscles; after an injury, it supports recovery and muscle mass growth, accelerates the healing of muscular and joint injuries, also suppressing pain in the back and the entire musculoskeletal system. It also eliminates muscle fevers that usually kickoffs the day after intense physical activity. Do not hesitate to ask our wellness staff for more information on this really interesting tool. You will most likely not find this specialty of our hotel anywhere else. 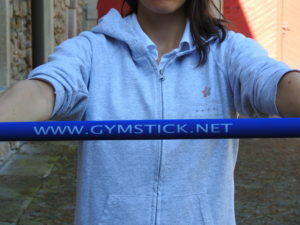 The gymstick, located directly in your rooms, will allow you to exercise and work out every single body part in the comfort of your own room. The gymstick is ideal for those that love to start off their day with some exercise, yet might be too lazy to leave their rooms. The spaciousness of all our suites makes it possible to lay out your fitness mat on the ground and work out without any restrictions. An instruction video, available in every room by the DVD player, will no doubt prove useful as well. If you want to take in a little fresh air, you can always take the fitness mat and gymstick with you outside to our English park. All in all, the perfect form of exercise! Our beautiful English castle park is very inviting in terms of sports and relaxation activities. Start your day off with a light jog through it, perhaps venturing out into the village as well, finishing off the run in the castle park with a few stretching exercises. If running is not your thing, a simple morning warm-up exercise routine will also no doubt do the trick. Whether it’s energetic tai-chi, chi-kung or classical yoga, all of these activities have a special atmosphere in the park that allows one to truly connect and become one with nature. Our beautiful, hundreds of years old tress will accompany you whatever the activity of your choice. Thanks to our wonderful location in the Vysocina region we offer a wide range of both sport & recreational activities to do in the area. Nordic walking, cycling, classic hiking, swimming in our quarry or in surrounding fishponds – that is only a very basic recollection of the various sports activities available in the area of the castle. Let yourself be inspired by our CHRONICLES OF EXPERIENCE and choose an activity that fits you the most. Even active families with children will find something for them to enjoy, whether it will be a bike trip around easy routes in the area or choosing a route from the bike project “Silver Borders”. You can find more information on www.stribrnepomezi.eu.